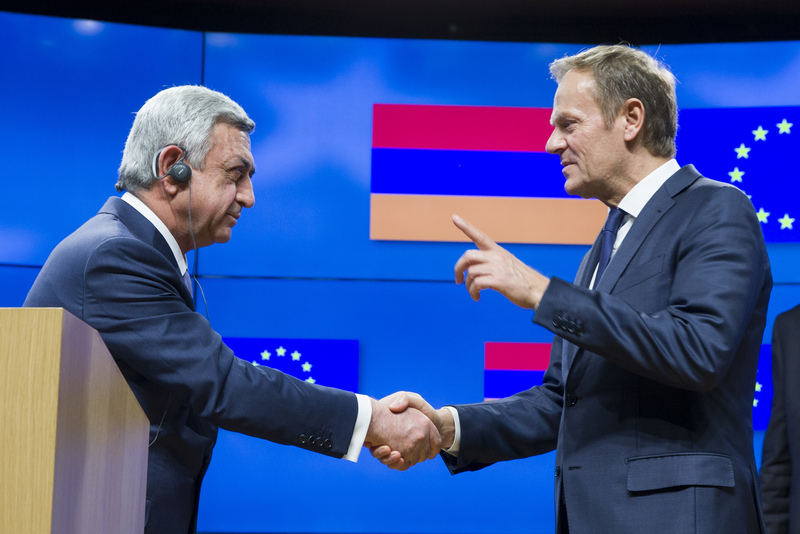 The last time Armenia negotiated closer ties with the European Union, in 2013, Russia swooped in at the last minute with a better offer to join the rival Customs Union and persuaded President Serzh Sargsyan to abandon the EU deal. The affair dealt a seemingly fatal blow to Yerevan’s hopes for substantive integration with the EU and cemented Russia’s position as the dominant player in Armenia. But now Brussels and Yerevan have gone back to the drawing board and worked out a new deal. And by all accounts, this new agreement is likely to be signed without the drama seen four years ago, primarily because the deal is watered-down enough to not threaten Russia’s position in the country. The new agreement, called the Comprehensive and Enhanced Partnership Agreement, has been tentatively approved by Brussels and Yerevan and is expected to be signed in November, at a summit of the EU Eastern Partnership program. The document has not been made public, but Armenian and European diplomats say it is very similar to the agreement reached in 2013, minus the provisions on free trade that would now conflict with Armenia’s obligations to the Eurasian Economic Union, the successor organization to the Customs Union. Russian officials have not publicly commented on the deal, but behind the scenes “Lavrov has given his green light,” a European diplomat in Yerevan told EurasiaNet.org, referring to Russian Foreign Minister Sergey Lavrov. “Through the process of consultations with all interested parties, including Russia, we explained that there’s not any more the issue of the Deep and Comprehensive Free Trade Agreement,” said Armenia’s deputy foreign minister and chief negotiator of the new agreement, Garen Nazarian, in an interview with EurasiaNet.org. That free trade component “was the main obstacle of signing the Association Agreement, because of our decision to join the then-Customs Union,” Nazarian said. As modest as the deal is, it does provide Armenia with a somewhat weightier counterbalance to its close ties with Russia. “For a long time we’ve been conducting a multivector foreign policy, and it’s our goal to maintain a very balanced dialogue between our important partners, Russia, the European Union, and the United States,” Nazarian said. Some in Armenia still remain wary of Moscow’s ability to play the spoiler. “You never know, because tomorrow Russia could take a gun out of its pocket and put it on the table, as it was in 2013,” said Alexander Iskandaryan, director of the Caucasus Institute think tank in Yerevan. Then, as Armenia and the EU were negotiating the Association Agreement, Russia pointedly announced that it was selling billions of dollars worth of arms to Armenia’s enemy, Azerbaijan, and floated rumors that it could dramatically raise the price of the natural gas it provides to Armenia, Iskandaryan recalled. “It was clear, they didn’t even need to say anything,” he said. Officials from the governing Republican Party of Armenia responded sharply. Justice Minister Davit Harutiunian on June 15 called the criticism “an attempt to interfere in our internal political affairs,” and some in Armenia’s opposition expressed concern that Harutiunian’s comments were the result of Russian pressure aimed at undermining the EU deal. But most observers believe that this time, the agreement is not in danger. One reason is that the geopolitical situation has changed dramatically since 2013. Ukraine, under then-President Viktor Yanukovych, was negotiating an Association Agreement similar to Armenia’s with the EU. Russia was intent on scuttling it, and Armenia was collateral damage, used to intimidate Yanukovych. “It was never about Armenia, it was about Ukraine – it was a signal to Ukraine, look what we can do,” the European diplomat said. (Yanukovych was subsequently overthrown and the new government completed negotiations with the EU on an Association Agreement, which is scheduled to enter force in September). Another is that the new deal is relatively harmless from Russia’s perspective. It commits Armenia to political reforms, many of them potentially difficult, while offering few economic and no security ties to Europe in return. “Now they [Russians] see that the geopolitical component is out,” said Tevan Poghosyan, a pro-Western Armenian politician and president of the Yerevan-based International Center for Human Development.